One of the longer-lasting and most productive black vocal group of the 1940’s and 50’s, albeit largely in the Pop Music realm, The Four Tunes made occasional forays into the rock field over a half dozen years but their success as a pop act made their attempts at achieving a sort of reverse crossover to rock ‘n’ roll seem half-hearted and compromised much of the time. The group began in 1946 as The Sentimentalists and achieved a #1 hit when backing fellow black pop vocalist Savannah Churchill in 1947. 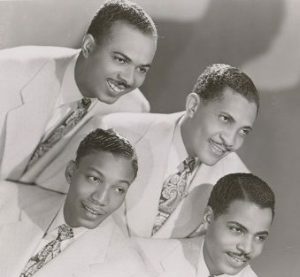 Two additional hits followed in 1948 as The Four Tunes and they were seen as potential competition for, or heirs to the style of, The Ink Spots, who’d been one of the few black vocal groups to achieve mainstream pop stardom throughout the 1940’s. When rock came along and offered far more opportunity to black acts to find success on their own terms without adapting their style to suit white audiences The Four Tunes had little incentive to join in and risk alienating their established fan base. But the music that was starting to make headway amongst rock vocal groups was conceivably suited to them if they allowed themselves to shed their mannered pose long enough to connect with it. From time to time they’d make the effort to, or at least try and bridge the gap between the two disparate styles, usually falling short of being accepted as authentic rockers because their widely known persona ran counter to that image, and because they rarely avoided hedging their bets with the deliveries, though a few times they came close and scored hits. Ultimately a fairly major act in the overall music scene of their era, but only a minor factor in rock ‘n’ roll due to choice more than ability.